Next Steps for Automatic Voter Registration, Renewable Energy, & More: Write or call by Thursday morning! UPDATE, 4/13/18: Thank you to everyone who called or emailed! All of these bills have now been passed in BOTH houses, and will head to the Governor’s desk to be signed!! 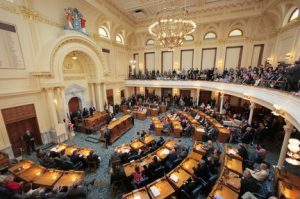 The State Assembly will be voting again this Thursday, April 12th. Contact your 2 Assembly members by Thursday morning and tell them to VOTE YES on automatic voter registration, renewable energy, and financial aid for NJ’s undocumented students! Please vote YES on bill A2014 for automatic voter registration at the DMV. Please vote YES on bill A3723 for 100% clean and renewable energy by 2050. Please vote YES on bill S699 to allow undocumented students who graduate from high school in NJ to apply for college financial aid. ← YOUR CALL NEEDED – Committees considering Automatic Voter Registration, Clean Energy & Earned Sick Leave on Thursday!